The beauty Conrad sees in nature is eerily similar to what a more materialistic Winslow sees in Wall street. Love is often in the eye of the beholder, but unrequited love is equally mysterious. I know what poison ivy smells like, and it’s not good. Some of these strips come from foolish personal experience … ahem! I agree. It’s not good, but now I know. Just stumbled on your comic, I have to say I LOVE your style. And this comic is classic. Hi, Jenn! Thanks for stopping by and the kind compliments. Hope to see you more in the future. Love the branch saying ouch, nice touch Doug. What’s up, Tony! Thanks on the branch thing. Every time I’m walking through the woods I hear that ‘snap’ and I wonder. I laughed so hard at this one that I almost choked. Thank you for the chuckle! Thanks, George glad you enjoyed it! Wow i really like the look of your Sunday comic. It’s colorful, alive and did i mention NATUREEEEEEE! Very nice Sunday strip. The color in the title panel is really nice. Thanks, Binky! 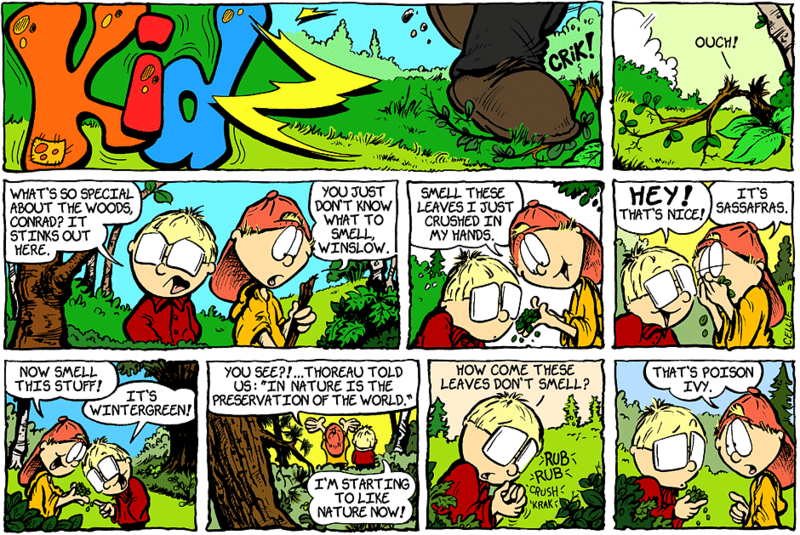 I wasn’t sure about the colors on this one so it’s nice to read they didn’t detract from the strip. Gotta agree with Yar-Yar, I love the Sunday funnies format! These can be time consuming, but so worth the end result. You nailed it, Chris. Thanks! I love the Sunday formats too, and the extended panels to tell a small story, but they really are time consuming. More than I thought it would be, but I’ve got so many jokes already written that require the Sunday format! Winslow is in for a tough time! well… hopefully he’s immune! LOVE the nice big Sunday format – beautiful artwork! I love this! I just got home from my son’s 5th grade field trip to a state park where we hiked, examined soil and collected creepy animals from the streams. I can guarantee that several children will be breaking out in poison ivy over the next few days. It was everywhere! Much appreciated! Heard your podcast a few days ago. Nice! I just discovered your comics and I love them!